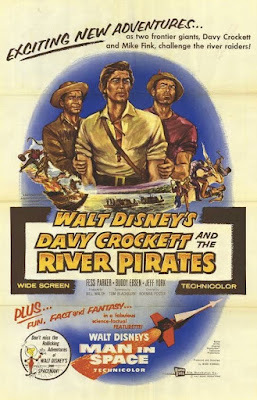 Even though Davy Crockett died in the third installment of his Disneyland series and the subsequent film made from them, Davy Crockett: King of the Wild Frontier, that didn't stop Walt Disney from making two more TV episodes and packaging them into a second feature film, Davy Crockett and the River Pirates. It's hard to call it a sequel since it actually takes place before the end of the first film, but no explanation is needed for audiences to understand that this is simply more stories about Davy. The film begins with Davy and Georgie heading North to sell their furs. They decide to travel by river and end up making enemies with Mike Fink, self proclaimed "king of the river." They agree to a keelboat race and Davy assembles a crew. Even though Mike Fink sets up lots of traps to prevent Davy from winning, he wins anyway and Mike Fink agrees to take he and Georgie North to sell their furs. On their way to get horses from friendly Chickasaw Indians, Davy and Georgie are kidnapped by a group of Chickasaws because white men have been killing members of their tribe. They enlist Mike Fink and his crew to help stop the river pirates that have been posing as Chickasaws. They set a trap for the pirates by disguising themselves and bragging about the gold they are transporting at different ports so that the pirates will come after them. A battle ensues as Mike Fink's keel boat sinks. Of course, Davy, Georgie and Mike are able to stop the pirates and make the river safe for passage as "The Ballad of Davy Crockett" plays for the last time. Davy Crockett and the River Pirates premiered on July 18, 1956, 8 months after the two episodes it was edited from originally aired. Like most fads, the Davy Crockett phenomenon had mostly died down by the time this film was released, so its success didn't match the previous feature. These were the final episodes for Davy on the Disneyland program and therefore, the last film. As a film, Davy Crockett and the River Pirates has better flow than King of the Wild Frontier, but the source material isn't as interesting. I find the Mike Fink plot to be fairly pointless and while the river pirates segment is a lot more entertaining, it isn't enough to save the first half of the film. And of course the preferable way to view this material would be in its original episodic form, not the repackaged feature. The series inspired two attractions at both Disneyland and Walt Disney World. The Davy Crocket Explorer Canoes are a fun attraction that are still available at Disneyland on the Rivers of America, but were removed at Disney World. And the Mike Fink Keel Boats were another nostalgic mode of transportation at both parks, but neither are still around. Walt Disney's Davy Crockett and the River Pirates is currently available on DVD paired with first film, Davy Crockett: King of the Wild Frontier. Both films are presented in fullscreen, the way they were filmed, but not their original theatrical aspect ratio, which was widescreen. All five original, uncut Disneyland episodes were released to DVD in 2001 as part of the Walt Disney Treasures collection. That 2-disc set was limited to 150,000 copies and has become heavily sought after by collectors. The film is available on iTunes, where it is available in fullscreen and in HD. You're able to observe unique movies which are divided into various categories including action on socksharenet, adventure, thriller, fantasy, and comedy Etc.